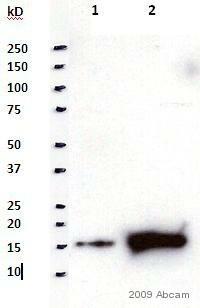 Rabbit polyclonal Interferon gamma antibody. Validated in WB, IHC, Neut, ICC/IF, sELISA and tested in Mouse, Human, Macaque monkey. Cited in 33 publication(s). Independently reviewed in 6 review(s). Recombinant full length protein corresponding to Human Interferon gamma. Mature Interferon gamma is from aa 24-161 of SwissProt ID Q14609. aa 1-23 represents the signal peptide. affinity chromatography employing immobilized Human IFN-? matrix. Our Abpromise guarantee covers the use of ab9657 in the following tested applications. To detect IFN-gamma by sandwich ELISA (using 100µl/well antibody solution) a concentration of at least 0.5µg/ml of this antibody is required. This antigen affinity purified antibody, in conjunction with compatible secondary reagents, allows the detection of 0.2 - 0.4 ng/well of recombinant hIFN-gamma. Can be paired for ELISA with ab9658. WB Use at an assay dependent concentration. 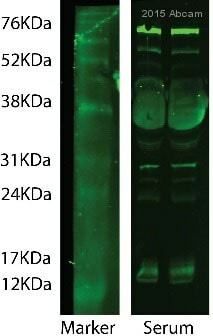 To detect hIFN-gamma by Western Blot analysis this antibody can be used at a concentration of 0.1 - 0.2 µg/ml. Used in conjunction with compatible secondary reagents the detection limit for recombinant hIFN-gamma is 1.5 - 3.0 ng/lane, under either reducing or non-reducing conditions. Neutralising Use at an assay dependent concentration. To yield one-half maximal inhibition [ND50] of the biological activity of hIFN-gamma (50 pg/ml), a concentration of 0.04 - 0.06 ng/ml of this antibody is required. IHC-P Use a concentration of 0.25 - 0.5 µg/ml. 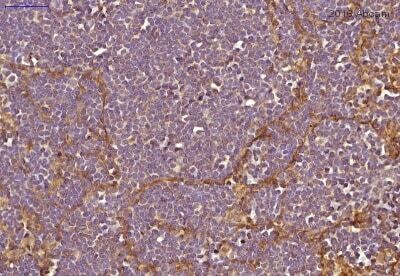 Immunohistochemical expression of IL-17, IL-23, IFN-γ and IL-22 in normal skin and BCC (basal cell carcinoma). Interferon gamma (IFN-γ) was detected using ab9657 in parafffin-embedded human normal skin and basal cell carcinoma skin tissue. (After Figure 1B of Pellegrini et al). 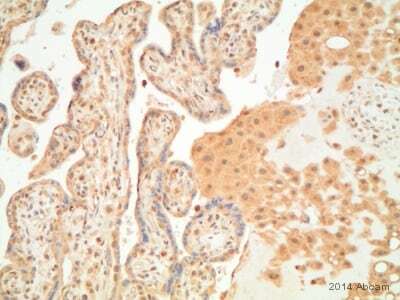 ab9657 staining Interferon gamma in human cervical squamous cell carcinoma section by Immunohistochemistry (Formalin/PFA fixed paraffin-embedded sections). Tissue underwent heat mediated antigen retrieval in sodium citrate buffer (pH 6.0). 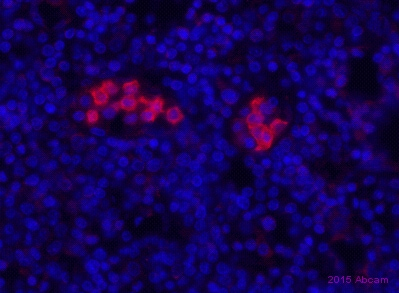 The primary antibody was used at 0.25 ug/ml and incubated with sample at 4°C overnight. A HRP-labeled polymer detection system was used with a DAB chromogen. To detect Human IFN-γ by sandwich ELISA (using 100 μl/well antibody solution) a concentration of 0.5 - 2.0 μg/ml of this antibody is required. 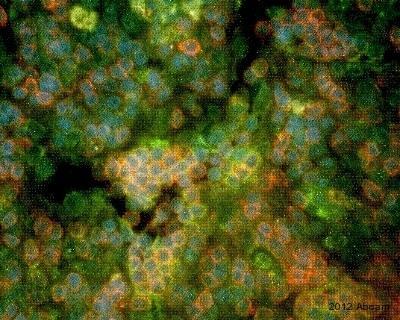 This antigen affinity purified antibody, in conjunction with a compatible secondary detection antibody, allows the detection of at least 0.2 - 0.4 ng/well of recombinant Human IFN-γ. Publishing research using ab9657? Please let us know so that we can cite the reference in this datasheet. There was a misunderstood, she uses formaldehyde as fixative. And all her samples are paraffin-embedded tissue. Customerwill perform some more tests. Could you please verify if there is another positive control more suitable than tonsil for all these antibodies ? A good alternative to tonsil is spleen and also tissue from the digestive tract, for instance colon or small intestine. Thank you for your enquiry. This antibody is sold at 100 ug per vial. We woudl recommend to reconsitute this in 200 ul of sterile distilled water. This will provide a stock concentration of 0.5 mg/ml. With regards to isotype, this antibody is a polyclonal. It will therefore contain a mixture of all antibody isotypes. However, the main isotype of polyclonal will be IgG. I would be pleased to suggest some suitable secondary antibodies. The secondary will need to be an anti rabbit IgG. In order for me to select some products, please confirm which application the customer is using. Also, which conjugate(s) they would prefer. I hope this will be helpful to you. If you have any further questions, please do not hesitate to contact us. Hi, Thank you for the response. Could you tell me please if the antibody only works using citrate buffer antigen retrieval pH6, or will EDTA pH8 work? Thanks. Rachel. Thank you for your enquiry. As far as we know only the pH 6 citrate buffer has been tested as a retrieval buffer for use with ab9657. It is certainly possible that a different pH buffer will also work, however we do not have any experimental data to speak to this issue. I hope this is helpful. Please contact us again if you have any further information.